A novel public-private partnership leads thinking and development for food, nutrition, and environmental security in the MENA region post Paris Climate Agreement. Agriculture, especially in the drylands of the North Africa and Middle East (MENA) region is a critical area for climate change action, now that the Paris Climate Agreement has entered into force. Yet the question remains whether multi-disciplinary collaboration and funding can be successfully leveraged to support some of the most innovative climate-smart initiatives across different sectors, including research, academia, private sector, policy makers, civil society, local communities and development agencies. Last month, at the Morocco climate conference (COP22), the new Urban and Rural Areas Resilience Programme on Oasis Cities (URAROOC) was presented, as precisely the kind of public-private partnership and investment needed to secure better livelihoods and natural resources management in the face of climate change for many dryland communities across the MENA region. These communities face enormous challenges that affect their socio-economic and political stability, in addition to the growing trend of conflict-driven migration. “The Urban and Rural Areas Resilience Programme Oasis Cities is a good example of climate action on both mitigation and adaptation under the Paris Agreement,” said Mr. Tomasz Chruszczow, Chair of The Subsidiary Body for Implementation (SBI) of the United Nations Framework Convention on Climate Change (UNFCCC) during the opening of the event. By responding directly to the Paris Climate Agreement call for greater engagement of non-state actors, the Oasis Cities programme brings together a diverse, multidisciplinary team, who seek to assess and evaluate the socio-economic aspects of the interconnections between oasis cities and their rural areas. This team will provide holistic sustainable solutions that can be scaled up to over 40 countries after testing in pilot projects in four desert cities, including Marrakech (Morocco), the Siwa Oasis (Egypt), the Nizwa Oasis (Oman) and the Liwa Oasis (United Arab Emirates). Designed with special attention to the various Paris Climate Agreement articles on mitigation, adaptation, technology development and transfer, capacity building and dissemination of climate knowledge, as well as consideration for key Sustainable Development Goals (SDGs), the mission of this new program is to generate viable, alternative livelihood strategies for people living in oasis ecosystems, while conserving biodiversity and safeguarding cultural knowledge and traditions for generations to come. “The programme introduces a new vision of the Oasis City, by espousing exciting developments and cutting–edge innovations in agriculture, technology, architecture, urbanization, whilst reviving and elevating local knowledge and traditions,” noted Dr. Abdelouahhab Zaid Prof., Secretary General of the Khalifa International Date Palm Award and Agricultural Innovation (KIDPAAI) and FAO Goodwill Ambassador to the UAE, at the opening of the event. The whole point of the Oasis Cities Programme is to define and roll out viable livelihood strategies, initiate new economic activities through technology development and transfer, build local skills and capacities, and identify and support the development of better socio-economic linkages between oases and related urban areas. In this context, Dr. Zaid went on to explain the “oasis effect” in terms of its environmental and socio-economic benefits. He urged that the holistic development of the oasis ecosystems can help – on a larger scale - mitigate the negative effects of climate change and resource degradation by human activities in dryland areas, where desertification affects over 100 countries and 1.5 billion people, who depend on these lands. The tone was set by Chris Trott, Head of Sustainability with Foster + Partners who painted a picture of the future sustainable and resilient city, while Dr. Sandra Piesik, architect and individual researcher with the same practice elaborated how indigenous knowledge and transfer of technology in date palm leaf architecture are incorporated in the program to create a new vision of the resilient oasis city. Dr. Piesik noted that “innovation, research and development and public-private partnerships play a very important role in the development and transfer of technology, particularly when it comes to the adaption of traditional technologies and resources to various stages of baseline, intermediate and developed technologies, whilst also helping to meet the socio-economic aspirations of rural and urban communities”. In this regard, “it is paramount to reach out, engage and support young people, particularly women, through training and skills development in technology, agriculture, entrepreneurship, access to funding, ” added Dr. Richard Thomas, Director of the CGIAR Research Program on Dryland Systems. Dr. Mohammed Ben Salah of the International Centre for Agricultural Research in the Dry Areas (ICARDA) noted the research evidence on the date palm as a “vital plant in the desert oasis eco-system, providing an important critical source of food, nutrition, and income for rural communities.” Across the world, there are over 3000 varieties of the date palm (including the better known ones, such as Deglet Nour, Medjhool, Zehdi, Barhi, Khalas), which are cultivated in 46 countries. 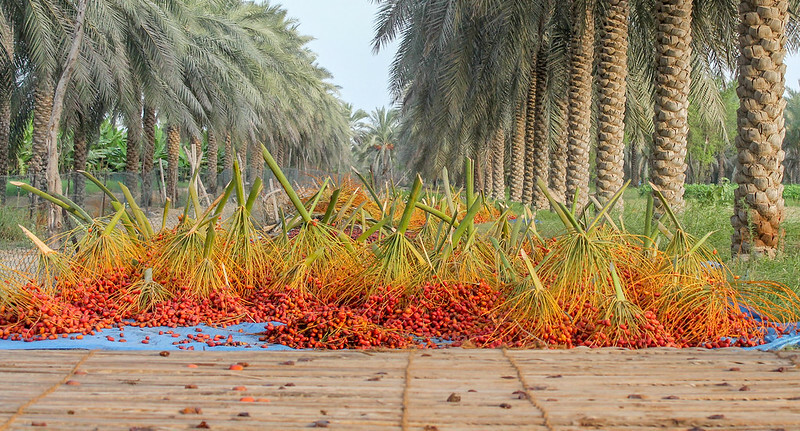 Specialized knowledge and labor are critical to the cultivation of date palms and sustainable oasis ecosystem development, particularly in the face of climate change. “Climate change has serious implications for the biodiversity, eco-safety, poverty eradication, socio-economic stability, and sustainable development in oasis areas, as well as globally. 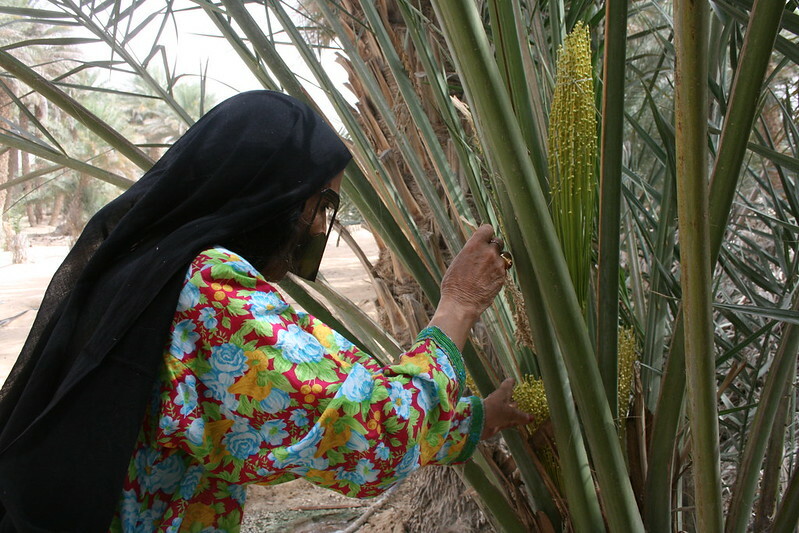 Demand for date palm production in oasis communities and drylands in general is bound to surge with increasing populations and food demand, which are exacerbated by other pressures, such as water scarcity and resource degradation,” said Dr. Zaïd Salah Eddine, Technical Director of the Marrakech Date Palm Project (MDPP). That is why MDPP with its cutting-edge technologies and laboratory on date palm genetics, propagation and increased species diversity has been set up to meet national demand for Morocco’s National Green Plan, as well as international demand for high quality date palms as a long term means to eradicate chronic hunger and poverty in drylands, whilst preserving and enhancing biodiversity. The MDPP intends to produce 100,000 date palm plants annually with the aim of doubling production within the first years. In this context, Dr Slim Zekri, Head of Economics at Sultan Qaboos University provided an overview of the key economic aspects impacting oasis development in terms of water management, as well as the principal measures aimed at increasing oasis profitability in a sustainable fashion, and the implementation of relevant policy frameworks and reforms. On the other hand, Mr. Sebastian Lange with contribution from Stephanie Loose and Jane Reid of UN-Habitat laid out how the Oasis Cities Programme would be a project in line with the global aim of enhancing urban-rural linkages for implementing the New Urban Agenda. The New Urban Agenda was adopted by UN Member States in Quito, Ecuador in October 2016. It sets global standards for urban development for the next 20 years with its key message of "Leaving no-one (and no space) behind". Mr. Lange noted that the successful implementation of the Oasis Cities Programme as aligned with the New Urban Agenda would also help meet several Sustainable Development Goals, especially SDG 11, target 11.a which stipulates "Support positive economic, social and environmental links between urban, per-urban and rural areas by strengthening national and regional development planning." Indeed, the Oasis Cities Programme builds on existing successful private sector initiatives, such as the Taziry Ecolodge and Sustainable Village in the Siwa Oasis, which was recently awarded the Sustainable Cities & Human Settlements Award at the 11th Global Forum on Human Settlements in Ecuador this past October. Described by many who have visited the place as “heaven on earth”, the Taziry village at the Siwa Oasis embodies the very concept of sustainability by “respecting nature and people, by promoting local art, culinary, spiritual and cultural traditions, and by ensuring future generations will get to enjoy and celebrate these aspects as well. We are very proud to be part of this ambitious project and share our knowledge and experience with others who seek to emulate it,” noted Mr. Taha Chaabi, Founder and General Manager. How do we help oasis cities attract climate smart investment necessary for implementation? Are there other cities that could collaborate with oasis cities to become “knowledge partners” and benefit from shared learning? How can oasis eco-systems contribute to the sustainability of oasis cities in the face of climate change? What are the best options, tools, mechanisms that oasis cities can utilize in order to better share “know-how” with each other? 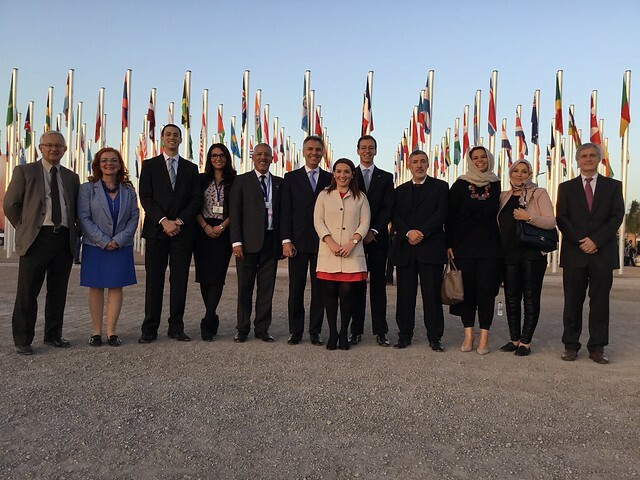 The enthusiasm and interest expressed by representatives of national governments, civil society and the private sector for this kind of program in the MENA region is definitely encouraging. Many countries and actors are taking steps of their own accord, seeking collaborations and partnerships to lay the groundwork for action at local and national levels, and the months to come will be critical to operationalizing the funding structure for rolling out the Urban and Rural Areas Resilience Programme on Oasis Cities. ICARDA and its CGIAR Research Program on Dryland Systems will continue to build and provide a body of research evidence that will help the partners in the Urban and Rural Areas Resilience Programme on Oasis Cities deliver progress on its ambitious set of targets. This will support implementation of innovative and climate-smart agriculture in the MENA region, as part of its mission to improve livelihoods in dryland communities. Dr. Sandra Piesik, Individual Researcher. Program design partners: International Center for Agricultural Research in the Dry Areas (ICARDA), Khalifa International Date Palm and Agricultural Innovation (KIDPAAI), Foster + Partners, a London-based global architecture and integrated design practice, the Marrakech Date Palm Project and 3 ideas Ltd. Date Palm Technology Transfer has been developed by Dr Sandra Piesik in collaboration with BuroHappold Engineering. Tana Lala-Pritchard is the Global Communications Program Coordinator for the CGIAR Research Program on Dryland Systems.